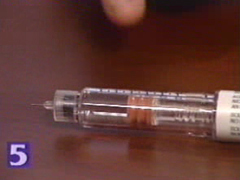 The number of Americans infected with swine flu continues to grow and a Texas infant who contracted the flu has died. The current outbreak is due to a mutation that has allowed the virus to be passed from human to human. Swine influenza virus is caused by Orthomyxoviruses that originate in pig populations. The strains of swine flu identified to date have been classified as Influenzavirus C or Influenzavirus A. On April 29, the World Health Organization raised its pandemic alert level from phase 4 to phase 5 in response to the outbreak of swine flu. The WHO recommendations include heightened surveillance, early detection and treatment of cases, and infection control in all health facilities. The symptoms of swine flu are similar to the symptoms of the regular flu and can include fever, cough, sore throat, head and body aches, chills and fatigue. In some reported cases, individuals have also reported diarrhea and vomiting. Like the common flu, swine flu can be especially dangerous for people with underlying medical conditions. Wet your hands with warm water (running if possible) and use liquid soap or clean bar soap. Be sure to lather thoroughly. Rub your hands together briskly for 15 to 20 seconds. Take care to scrub the backs of your hands, wrists, between your fingers and under your fingernails. Rinse your hands well to remove all soap residue. Dry your hands on a clean, disposable towel and use that towel to turn off the faucet. Swine flu is thought to be spread the same way common flu spreads – mainly from contact with an infected person. Being exposed to a person with influenza who is coughing and sneezing or touching something with the flu virus on it and touching your mouth or nose can infect you. Infected people may be contagious before symptoms develop so practicing good hygiene at all times is important. According to Lisa A. Graves BS, RN and Infection Preventionist at Hebrew Rehab Center in Boston, hand washing is the best way to prevent the spread of infection. Graves also suggests other steps to take to avoid getting sick including using cough and respiratory etiquette. 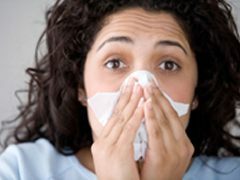 “If you sneeze or cough do so either in your anticubital (elbow area) or in a tissue, never in your hands and if you do, wash your hands immediately after. If you use a tissue, discard, don't reuse and wash hands immediately. Avoid touching your nose, eyes and mouth, if you do wash hands afterward,” said Graves. Avoid surfaces that could be infected with the flu virus and avoid contact with people who are sick. Note that some viruses can live for more than two hours on surfaces such as countertops, tables, doorknobs or desks. What if You Feel Sick? Swine Flu or Regular Flu? Swine flu is not spread by eating or preparing pork. Eating properly handled and prepared pork is perfectly safe. For the most current information on the swine flu, visit the CDC website , the Boston Public Health Commission or the Massachusetts Department of Health and Human Services. An update on the H1N1 vaccine: The swine flu pandemic has prompted many makers of seasonal flu vaccines, including Sanofi Pasteur, Novartis AG, and GlaxoSmithKline PLC, to ship them to the US market earlier than usual. This is due to expectations for an increased demand for flu vaccines as well as to prepare for production of an H1N1 (Swine Flu) vaccine. It is expected that doctors may face challenges in vaccinating partients first against seasonal flu and later a two-round shot against H1N1.